Author: Itani, Frances Set In . 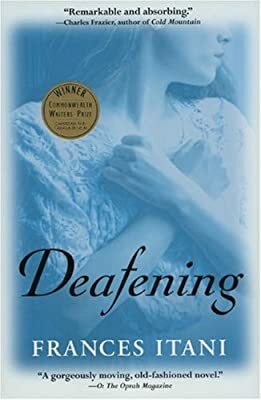 . .
Set during 1915-19 in Canada, United States, England, Belgium and France, this is the story of a young woman in her 20’s, Grania O’ Neill (pronounced GRAW-NEE-YA, an Irish name meaning ?Love”), profoundly deaf from the age of 5 as a result of scarlet fever. She marries Jim Lloyd, a hearing man who, 2 weeks after their marriage, leaves home in Ontario to serve his King and country and ?do his bit for Mother England.” Jim tries in every possible way to understand his wife’s experience of deafness, and together they explore their love through the silence in which she lives. Jim is trained as a stretcher-bearer in one of the large camps on the southeast coast of England. He serves in Belgium and France with Number 9 Canadian Field Ambulance. His war experiences, friendships, and care of the dying and wounded during this brutal war of attrition, are moving, intimately detailed and carefully researched to show the realities of the life of a stretcher bearer serving in the front lines. On the home front, Grania’s childhood in a small town on the edge of Lake Ontario, where her father owns a hotel; and as a residential student at ?The Institution for the Deaf and Dumb” in a small Ontario city. A bright child, she has to learn ?real” sign language (which replaces the private language she and her sister had, as small children, invented). She also learns, by necessity, extreme self-discipline and control over her emotions, which enables her to survive the trauma of leaving home and the facts of institutional life with 300 other deaf children around her. No visits home are permitted during the school year. Grania’s Mother, guilt-ridden and never accepting of Grania’s deafness, tries to make Grania hear. She tries for cures by miracle, and by taking her to Rochester, New York, in hopes of finding specialized medical treatment. Grania’s early experiences inside her own silence and within a family that tries to overprotect?despite her gradually developing independence and strengths?later illuminate the complexity of her adult relationships: with her closest deaf friend, Fry; with her older sister Tress?who was once her lifeline; with her Irish Grandmother, ?Mamo” (the most important person in her life at home and the one who teaches her to read and to speak, and whose love twice?in separate ways?saves Grania’s life); with her 2 brothers; and with her parents. After Jim departs for the war, both Grania and her sister move back to their parents’ home and hotel, where everyone in the family helps out with the hotel business. The tension in the book is held through the juxtaposition of two worlds: the world of war, violence and sound as shown through Jim’s horrific experiences at the Front (which include several major battles); and life for Grania inside the silence of her own world during the long years of waiting on the home front?where news is frequently bad as more and more local boys are reported killed in the war. Grania’s brother-in-law, Kenan, returns from the war in early 1918. He is wounded and mutilated and has stopped speaking. It is Grania who, with her extensive speech training recalled from residential schooldays, makes the breakthrough to Kenan’s speech. But this success creates resentment in her sister because Kenan is not able to confide or share his war experience with his young wife. Events move quickly toward resolution as first, Spanish flu sweeps through the town ( a deadly pandemic), followed by Armistice (Nov 1918) and eventual demobilization. A moving sequence of events with her sister releases tensions between Grania and Tress. The loss of Mamo finally leads to the release of emotions Grania has never permitted herself to express.